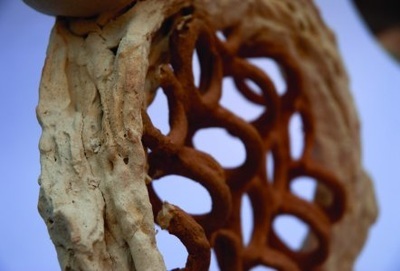 While a student Graham Hay developed unique paperclay and compressed paper sculpture techniques. 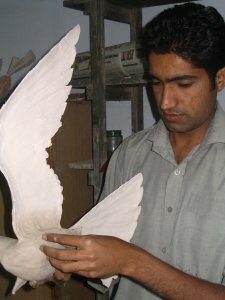 Since then he has conducted over 140 workshops and presentations in Australia, Scotland, Wales, Lithuania, Hungary, Pakistan and Singapore and is now recognised as a leading international pioneer in paperclay techniques. 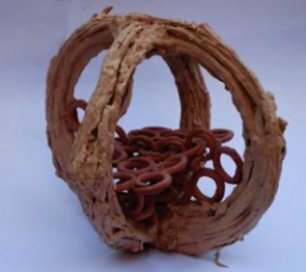 Selected for international survey exhibitions in Scotland (2000), London (2001)` Holland (2002) and Hungary (2004), his work features predominately in both international books on paperclay, and on the cover of the UK textbook. An invited demonstrator at the Australian National Ceramics Conferences (1999, 2003), the Geelong National Fibre Forum (2004), an invited guest artist in Scotland (2000), Wales (2001), Lithuania (2002), Graham Hay was invited to lead the First International Paperclay Symposium at the International Ceramic Centre in Hungary in 2004. Born in New Zealand, Graham Hay is a graduate of Dunedin Teachers College, the West Australia, Edith Cowan and Curtin universities (1st Class Honours in Visual Arts). He is a nationally accredited CraftMark practitioner, an invited member of the Potters Society of Australia, a member of the National Association for Visual Arts, Craft Victoria, Form (Craft Council of WA), Viscopy, and Art Source (Artists Foundation of Western Australia). A founding member of the Thermal Shock Ceramic Group and the Robertson Park Artists Studio, he lives and works in inner-city Perth, Western Australia. 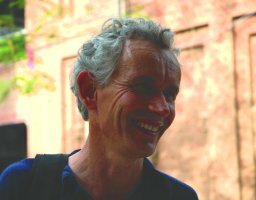 He has received Western Australian and Australia government grants and writes for Pottery in Australia, Ceramics Technical and other national and international craft and ceramic publications. His work has been in over 60 exhibitions, with works acquired by the International Ceramics Studio (Hungary), Panevezys City (Lithuania), Art Gallery of Western Australia, Town of Vincent, (Australia) MCG Collection (USA) and the North Queensland Potters Association, (Australia). 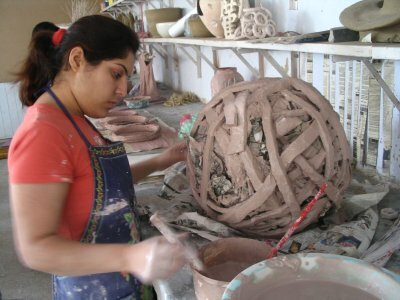 The Artist in Residence program, through which the institute aims to enable participants to become a part of the diverse field of study offered at an institute, seeks to introduce an interactive form of a learning experience for both the students at the college and the Artist in Residence. The value of an invited artist in residence lies in the fact that we get to see the "living product of a different environment" operate in our own system. The larger host group is effected in a very positive manner, through their shared experiences and projects they exchange ideas and collaborate events, conferences and research which results in new creative work, and in this case we were introduced to unbounded imagination with visions refreshed. When I first came across Mr.Hay's work in Anne Lightwood's very valuable book "Working with Paper Clay and Additives", I immediately decided to get in touch with him. I searched for his name on internet, found his website, which is a world in its own, and asked for his availability. His response was prompt and here we are sharing very different experiences from across the continents. It was amazing to know through his slideshows that one of his famous work that actually made me invite him, got broken many times before it was finally photographed, was mended back to perfection every time, and was never fired, but recycled instead! So this material makes you feel so comfortable with your work. Fear about losing your work seems irrelevant, less emotional attachment to work helps you develop at an accelerated pace. 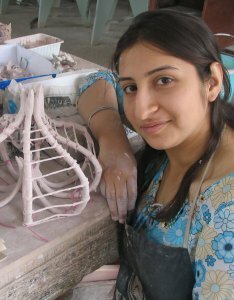 For all of us it has been an endeavour, a learning experience and a new opening of possibilities in the clay world. 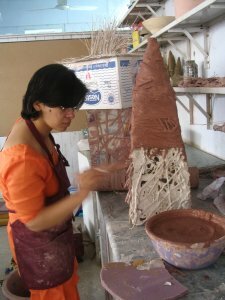 It is always a stimulating experience accepting an invitation to place oneself within a different environment, language and culture, with different people, clays and kilns. New ideas, perspectives, directions and friendships, are just some of the outcomes. It is a stimulating experience introducing a new art medium which does not have an established cannon of aesthetics or techniques, to a group of bright students and staff. The experiences and work challenges students, teachers, curators, and audiences. The fun for audiences is trying to understand “what happened” and to guess where it will eventually lead. Paperclay, in case you haven’t heard already, is processed cellulosed fibre (generally beaten paper pulp) added to any clay. 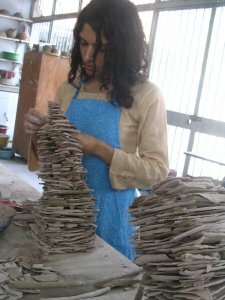 In some regions of Australia between a third and a half of clay bought by teachers is paperclay (personal comm. Australian art suppliers). Similar patterns are appearing around the world. 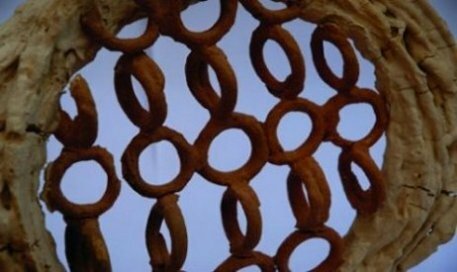 And for good reasons too: Mechanical recycled of clay either by hand or pug mill is no longer necessary (just drop firm or dry paperclay into water to soften). Small air bubbles in the clay body can be ignored (the fibre acts as vents), repairs/alterations to dry work can be made and final works don’t always need to be fired. Works can be left to dry, and resumed weeks later after soaked in water. 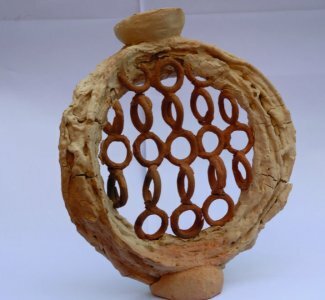 One of the directions taken up with enthusiasm by staff and students at the National College of Arts, has been to explore the unfired option with paperclay. That is, make objects from paperclay dip, or coat various materials with paperclay, and not fire the work. In a sense art is not just imitating life, it has become a thin surface skin on nature. Aside from the technical interest, this metaphor for our species living off animals and plants on the thin crust of this planet, is but one of many interpretation which may be drawn from this work. and an emphasis in architecture on the interior space, rather than the outside1. While here I drew from an image of an unrolling New Zealand fern leaf, which contained circles within circles. My own concern in sculpture is with how structures compound up from micro to macro scales. The exterior texture and colour is simply a by-product of the way I build. For these works I considered which should come first, the outer protective shell or the parts within? The firing of the work up to 1050oc is the ultimate test of these ideas. The body of work produced during this month does not follow any single theme; it’s more about experimenting and stretching an new material to the limits. Looking at formal solutions, possibilities with very thin clay work, and dry joining has interested me the most. To me it is kind of an artistic liberation, from the way I used to approach this diverse medium, and eventually the way I connect to the work that is born. I have used paper clay slip for dipping/spraying textile materials and pieces of baby clothes to make delicate assembled works, conical forms and hanging sculptural pieces. Working in paperclay is very interesting. It has its own language and behaviour. Initially I found it difficult to understand the character and nature of the clay but then I enjoyed its challenging characteristics. All of us have done a lot of unbelievable experiments in it. Now we can make the things, which we thought were impossible. Paperclay also has its own world of texture and feel. 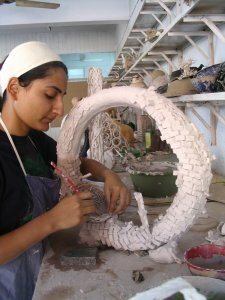 The entire process of working in paperclay is a series of challenges and surprises. 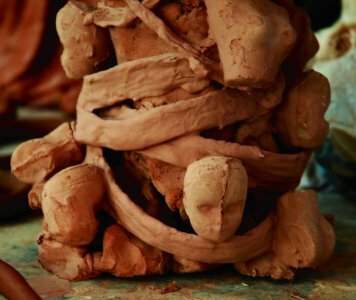 Every stage in the process from preparing and understanding the material, to making the piece in entirely a new direction, to firing it, has its own constraints and rhythm. This makes the process much more interesting and boosts our energies to explore more in such a magical method. Now, we don’t have to worry about the rapid drying of clay because unlike other clays, it works much better in dry form. 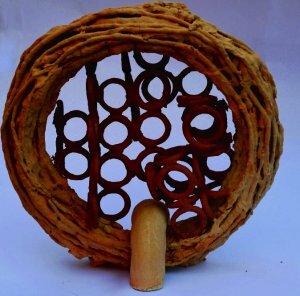 My pieces are a general exploration of the material and its many possibilities. Working in paper clay has been an absolute delight! I got to explore a completely different clay body. It’s an easy, feasible, and liberal material to work with. There’s so much one can do in paper clay. Sky’s the limit! Thanks Mr. Hay! One of my works is titled "ESCAPE" which is about the constant struggle one goes through, to find the "CORRECT SOLUTION" to a problem; Hence the use of "KEYS" and a "KEYHOLE". I‘ve also played with various styles of spectacle frames fixed to a cube, stating how we’re constantly being "WITNESSED" by those around us. No matter how many books you may read on paper clay, you can’t get the feel of the medium unless you work in it. That’s when you start exploring the many possibilities. The one thing that really appealed to me was that in paperclay don’t have to worry about being unable to work when it’s dry. Also, unlike other claybodies it has greater strength. 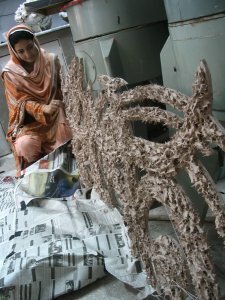 My work depicts the destruction caused by the Oct. 8,2005 earthquake in Pakistan. My piece is in loving memory of our fellow citizens who lost their families and homes in that earthquake. 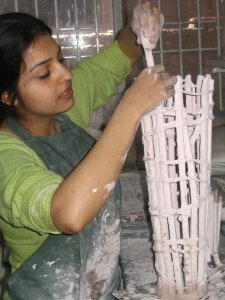 To work in paper clay was really challenging, not only it became possible for me to portray my ideas in clay, but also I’ve learnt a lot of techniques about how to use this material. One of my works is titled “nature”. I feel the initial stages of my work are more influenced by it. 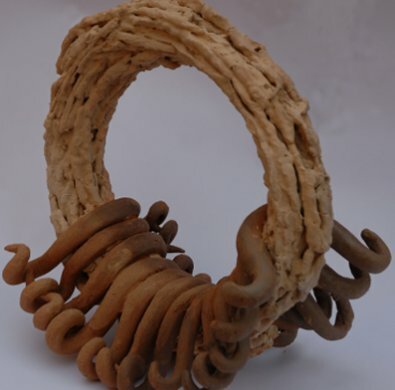 Paper clay has its on qualities and possibilities, which makes it a complete material for a ceramist. 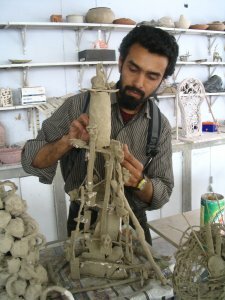 The most convenient aspect of paper clay is that, it can be joined in dry state, which proved to be very helpful in my work. I heard about a workshop in ceramics about Paper Clay, it fascinated me a lot. I was surprised to see Graham Hay’s work, when I saw his website. At the workshop watching him work was a unique experience. He explains the possibilities of the medium and then lets his students explore. I found him interested in circles and curves, looks like he’s the master of using shapes. As a whole I’ve learnt many new things and this includes all the work he showed us in slide shows, Graham at work, his technique, experimentation. My experience was very pleasurable and refreshing. I’ve learnt new ways of working with clay. Had never thought of using this medium in such different techniques. Although I found it very difficult in the beginning but very soon got the hang of it. It helped me in broadening my vision and improving my skills. This workshop gave me independence of thought, which will further help me with innovative techniques and make projects interesting. We got a chance to interact with Mr. Hay. If I were given another chance to join the workshop, I‘d not give a second thought! 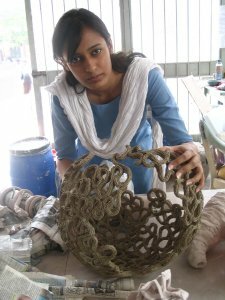 Working in paper clay was just like looking in clay in a whole new perspective and a new world of creation altogether. Paper clay was good to work with, the best part being the fact that it was recyclable, mend able, and even just the slip can be used to construct forms. 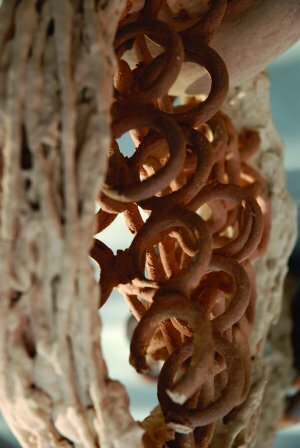 Some of the few things that I found difficult were that rather than the regular clay paper was and impurity to clay so its elasticity seemed to affected. On the whole it was a diverse experience. Working with paper clay made me experiment all those forms that I was ever scared of attempting. It involves more of experimentation and allowed me to go wild with my imagination in a way I was no more afraid of crack, as I could always fill them up at any stage. Its not a must to build the form in one go. Small units can be built and later joined to make a large scale sculpture. 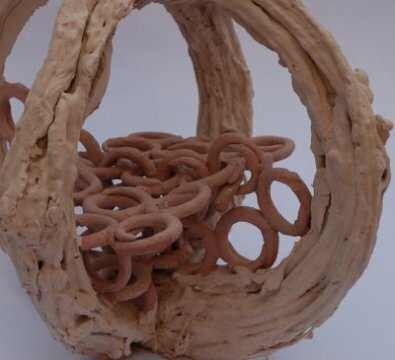 We could actually use various combustible materials as our armature such as leaves wooden piece, paper cuttings, wool and cotton by dipping in clay. Initially, I had an experience with the paper clay but this time it was easier and quite a lot of fun working with the new recipe. 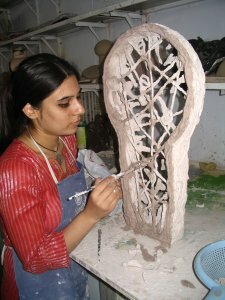 Large-scale sculptures and different forms are easier to handle and even cracks and breakages can be cured at any stage easily. Quick drying and dry-to-dry joining are a lot easier in it. Paper clay expands the boundaries amazingly. The last three weeks I have spent on exploring this new medium were mind opening working at solutions for problems in handling the forms. My perception of clay has changed completely. 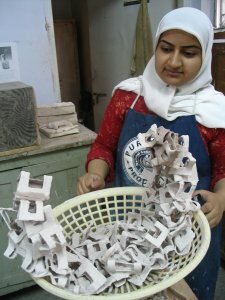 The paper-clay workshop was a complete eye-opener to me. I have been dabbling in pottery for the past eight years but I have never felt as much in control as I do now. Being able to work in both the plastic and dry form demands more creativity and pre-planning, and execution is much more exciting and rewarding as you can do twice as much work in half the time. This freedom is, in itself, a very enriching experience. Read more:​ www.grahamhay.com.au/hay2006pyre.html is a journal article by Graham Hay on the residency.